A school that bakes parent engagement into its strategy for student success is a school after my own heart. Intrepid College Prep Schools, a Tennessee Reward School scoring in the top 5 percent of schools in the state, is a superstar in an ever-growing, beautifully diverse southeast Nashville. Opportunity Academy, the organization’s flagship middle school, sits in the busy, traffic-burdened Antioch “business district.” It’s housed in a nondescript building adjacent to a church. I had an opportunity recently to delve into the world of a charter school founder who still leads the school while boasting improvement from its launch until today. Mia Howard is a straightforward, no-nonsense CEO with a quiet confidence that could rival Muhammad Ali. Very early in our conversation I got the impression that Howard never leaves well enough alone, that excellence is something for which to strive, not attain. So when the Brooklyn native says “This is our best year yet!” I believe her. Howard knows exactly why her school is successful at preparing its students for college. Relationships and data. Yes, the touchy-feely stuff and reliance on numbers (“numbers do not lie”) are what makes this school soar. Interestingly, relationship-building does not fall in the half-hearted, olive-branch category that it is typically assigned. Relationships with parents, teachers and amongst school leadership is an integral part of the strategy of success for Intrepid’s students. So, even relationships are informed by data! And when it comes to parents, Howard says: “Parents are so important because they chose us.” The school has an open door policy and treats parents as peers and considers itself a school that belongs to parents and students. Little wonder why 88 percent of parents attend report card conferences—striking for a middle school. “Measuring results, not intentions” is in big bold letters on the school’s website. 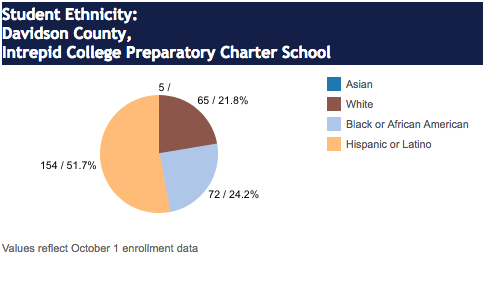 The student population at the four-year-old school is 51.7 percent Hispanic, 24.2 percent Black, and 21.8 percent White, 35.6 percent English language-learners and 89 percent economically disadvantaged. For Intrepid, this data is used to inform—not make excuses. And the CEO knows precisely what needs to happen to increase achievement and close gaps between diverse student groups. Intrepid’s dean of culture analyzes data weekly, including whether or not teachers are calling parents every two weeks as required. It’s tough to separate relationship-building and use of data because they work hand-in-hand at Intrepid. Internal and external relationships are nurtured and continuously improved. The anti-charter school noise does not distract Howard from the mission of educating Intrepid’s students because creating a proof point where 90 percent of Intrepid alumni complete four-year colleges is at stake. Of course, Howard is well aware of the negative narrative pushed out there, but knows it can be easily dispelled with numbers (remember, “numbers do not lie”). She also understands that taking her eye off the prize runs the risk of losing a high-quality option serving traditionally underserved students in a severely overcrowded part of the county. It’s not a risk she’s willing to take, because of the babies. There’s a reason she has been recognized in the Nashville Business Journal’s 40 Under 40. This fall, 97 percent of Intrepid’s graduating eighth-graders are headed to the charter network’s new high school, Independence Academy, opening in a recently purchased building near the middle school. In addition to satisfied students and families, Howard proudly clued me in on the high retention of her middle school students—above 90 percent in all grades—and teachers and leadership—88 percent. Considering what an indelible impact Intrepid College Prep Schools is making on the southeastern corner of Davidson County, I’m already looking forward to Independence High’s first college signing day in 2021! An original version of this post appeared on the Volume and Light Blog as Founder and Leader Mia Howard, Mastermind Behind Success at Intrepid College Prep Schools. Photo courtesy of Nashville Business Journal 40 Under 40.